This last weekend, seven-year-old Denali Brown led a squatching expedition up off Bluff Creek Road, near Fish Lake. Her dad tagged along for the adventure. 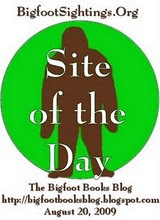 Many recent reports of Sasquatch activity in this area have been lodged here at Bigfoot Books (see our previous post). Just a little ways past the Fish Lake t urnoff on Forest Road 13 (13N01) one will see a small turnout with a wooden fence. This is BLUE LAKE, a pretty little body of water partially covered in lily pads, and surrounded by some very squatchy, dense forest. Here the pinacle tree species is the Port Orford Cedar, which has a fine redwood-like bark and fronds, and here towers above the visitor in an old-growth state. Unfortunately, many of the trees here are blighted with a fungal disease that causes root rot and die-off. Many of these trees towering above are dead, others have fallen down into the hillsides and the lake itself. The understory is mostly tan oaks and smaller shrubs. It is a peaceful, dramatic spot that would provide ample interest, food and habitat for a Bigfoot. To get to Blue Lake turn west from Highway 96 onto Bluff Creek/Fish Lake Road. Continue on just about seven miles up (go past the turnoff to Fish Lake) and it's on your left. If you continue on this road you will enter some classic Squatch territory, Onion Mountain and Blue Creek Mountain, where footprints were found back in the sixties, predating the Patterson-Gimlin film. Stopping along the way about six miles from the lake, just above Big Foot Creek, we caught a fine glimpse of the Bluff Creek drainage to the north. One can see out to Louse Camp area, and then the bend in the creek to the east where the film was shot. Get out and EXPLORE the environs. Though many sightings are along roads, that is just because that is where people most often are. Where Sasquatch most often is is in the deep, thick woods. RECONNOITER. Use technological enhancements, binoculars by day, night vision or thermal imagers by night. That brown thing beside a tree on the hill could be a Sasquatch trying to blend in. Come prepared! Bring a camera, too. ...WOOD KNOCKING. This is another way to make sounds carry over large spaces. It is said that Bigfoot creatures let each other know they're there, or send warnings, by banging on wood. No other animal could hold a stick to do this, save for a human--you need hands. But don't let the woodpeckers fool you. Check for FOOD SOURCES. If there are edible things (like these berries) around you can probably assume a Sasquatch will be there. This is one way to know if you are in the right spot or not to find them. Check around for FOOT PRINTS. Any ordinary depression, like this one made in boggy mud, could have been made by Bigfoot. Look closely. Do you see any foot-like features? Or maybe it was made by a bear, or another cool animal. Bring plaster or other material to make a cast of the prints you may find. THINK LIKE A SASQUATCH. 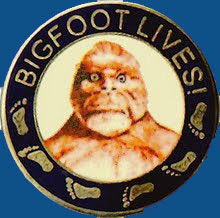 Dwell in the environ-ment, try to see how a Bigfoot would live. Could it hide in here? LISTEN AND LOOK, and WATCH OUT. Here, "Dada! What was that! I heard something over there! ... I'm scared. Let's go home!!! When you're done head back down to the Bluff Creek Company and Resort, at the bottom of the hill, then head just a mile or so north to the bridge where Bluff Creek flows into the Klamath River. Here you'll find a fine place to take a dip. The place is simply crawling with little baby toads, though, so WATCH OUT! If you're so inclined, you can explore the higher peaks to the west and north by simply continuing on up the dirt-and-gravel Bluff Creek Road. Eventually the road leads down to the creek at Louse Camp, where famously the Pacific Northwest Expedition set up their base. Watch out for rock slides, however. The road up to the P-G Film Site is blocked just up from Louse, so you'll have to take another way out. Sightings have recently been reported in the area of this camp, too.